The Traditional Trafalgar Concealed Thermostatic Valve with rigid riser will compliment any classic bathroom suite, offers thermostatic showering via two easy-to-operate controls for temperature and flow. This valve has the added safety benefit of a built in anti-scald device should the cold water supply fail. The traditional shower rigid riser kit is comprised of exposed pipework with a 4" Chrome Apron shower rose on an adjustable ball joint. Q. What warranty comes with this shower? 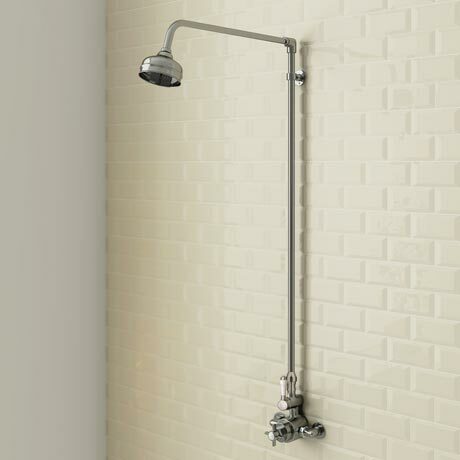 The shower valve has a 5 year guarantee and the riser has a 10 year guarantee. "Love the feature, looks both modern and classic, very classy and not your average fitted shower."